Loose Moose. Probably just wanted to play Bingo. A Moose burst through the dining room window of a retirement home in southwestern Sweden, knocking over furniture and flower pots before taking off into the wild again. Police say aside from the moose, who was scratched by the broken window, no one was injured in the overnight surprise visit at the Brunnsgarden retirement home in the small town of Alingsas. July 4, 2011 Posted by oldstersview | animals	| Comments Off on Loose Moose. Probably just wanted to play Bingo. X Factor judges — and former Idol cohorts — Simon Cowell and Paula Abdul had an encounter of the supernatural kind last week when they unknowingly checked into a haunted hotel in Dallas during their show’s audition tour. Intending to stay at The Stoneleigh Hotel & Spa during their time in town, the judges — including L.A. Reid — didn’t last long at the luxury digs. 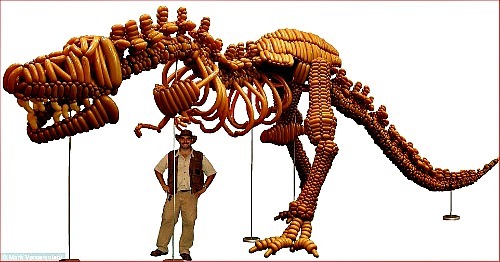 Try competing with this balloon artist and you would definitely be wasting your breath. The human navel should be designated as a bacterial nature reserve, it seems. The first round of DNA results from the Belly Button Biodiversity project are in, and the 95 samples that have so far been analysed have turned up a whopping total of more than 1400 bacterial strains. In 662 cases, the microbes could not even be classified to family, “which strongly suggests that they are new to science”, says team leader Jiri Hulcr of North Carolina State University in Raleigh.